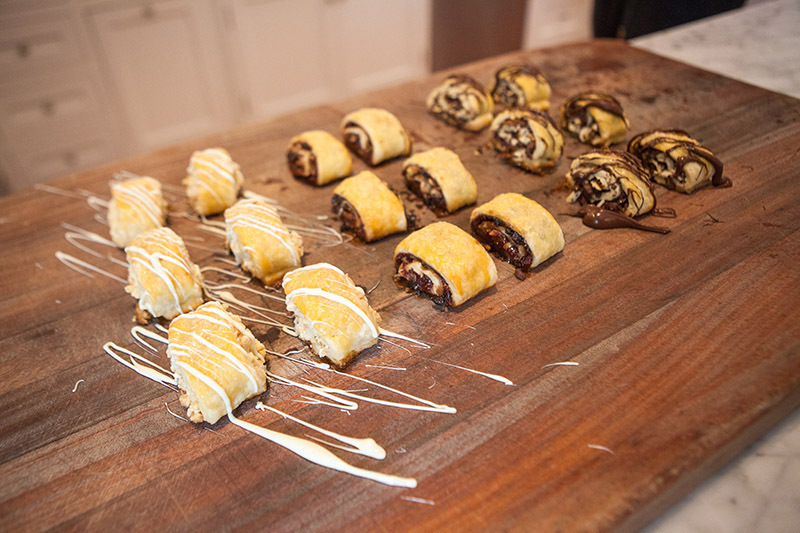 Not Your Regular Rugelach will make your belly happy this holiday season. 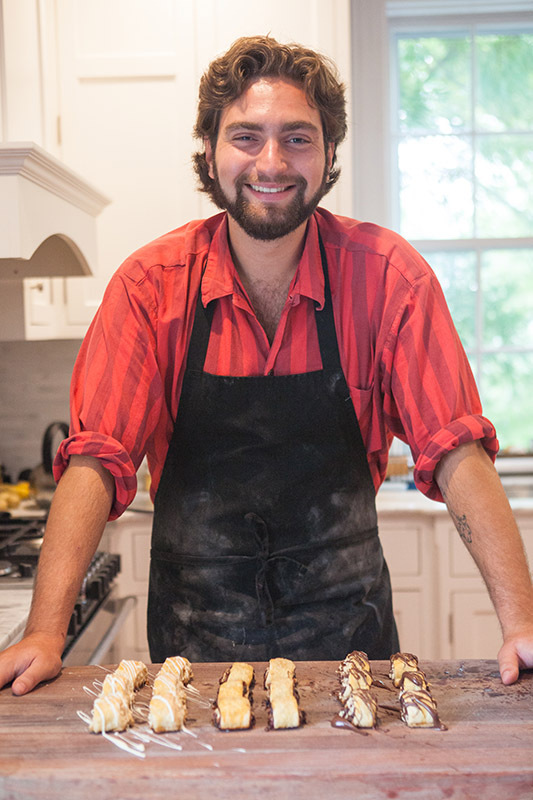 It doesn’t take a lot to make rugelach, but Avery Lazes makes sure to put a lot of love into all the rugelach he makes. That’s only natural, after years of making rugelach with his dad. Growing up, he looked forward to holidays or family celebrations, when trays of the small glazed puffs were ripe for the taking. 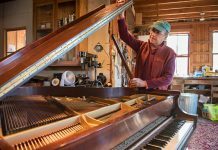 Now a senior pursuing a degree in music therapy at Berklee College of Music, Lazes is no longer a diaper-clad little boy covered in flour and cream cheese, mixing dough with his family. 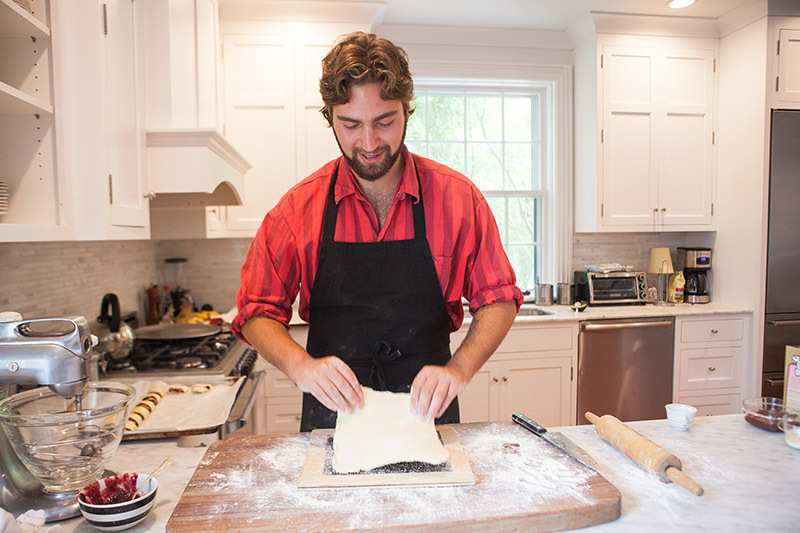 When his summer job as a pastry chef fell through, he decided to venture back into the kitchen, and launched his own business, Not Your Regular Rugelach, to bring his favorite treat to friends, families, and those unfamiliar with it. What is rugelach, some of you ask? This pastry of Jewish origin has as many spellings as it does fillings. (Other spellings include rugelakh, rugulach, rugalach, ruggalach, rogelach, rugalah, rugulah, rugala, and roogala. The last one is my favorite.) The dough is typically made with cream cheese and sour cream, and it can be filled with pretty much anything. Fruit preserves, nuts, chocolate, marzipan, or poppy seeds have their place in certain recipes, but the most common flavor is cinnamon sugar. It is sometimes shaped into a crescent, rolled into a cylinder, or cut into squares. 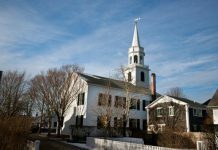 “It’s an unknown enough pastry that I think it gets that wow factor,” Lazes said as he rolled out dough at a friend’s house in Vineyard Haven. He worked with his stepmom Jamie Hamlin, of V. Jaime Hamlin & Sons Catering, since he was in seventh grade. “My stepmom hates baking, so I got thrown all the baking jobs,” he said. “She can cook like no other, though. 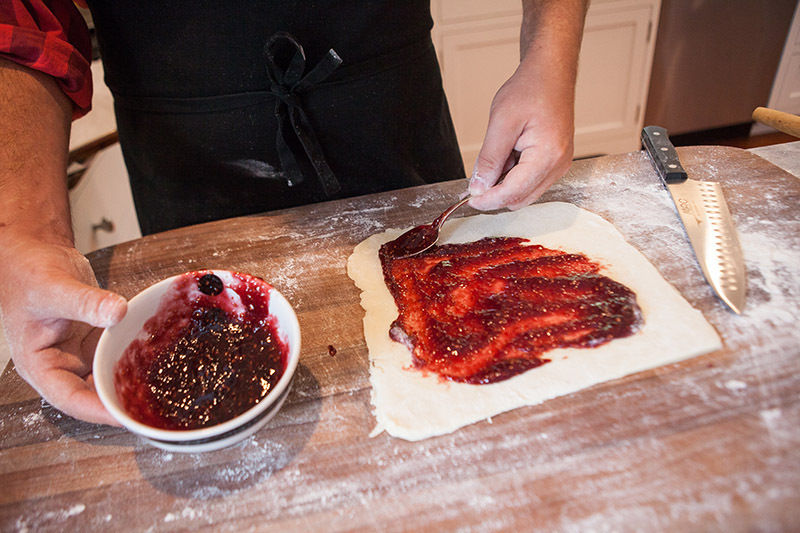 “I didn’t think of [making rugelach] as a business idea until somebody asked me about it, and I said, Well, it’s not your regular rugelach. The name clicked for me, and I thought, ‘That’s a perfect business name,’” he said. With the name settled, he started testing recipes and passing out samples to friends and family last summer. 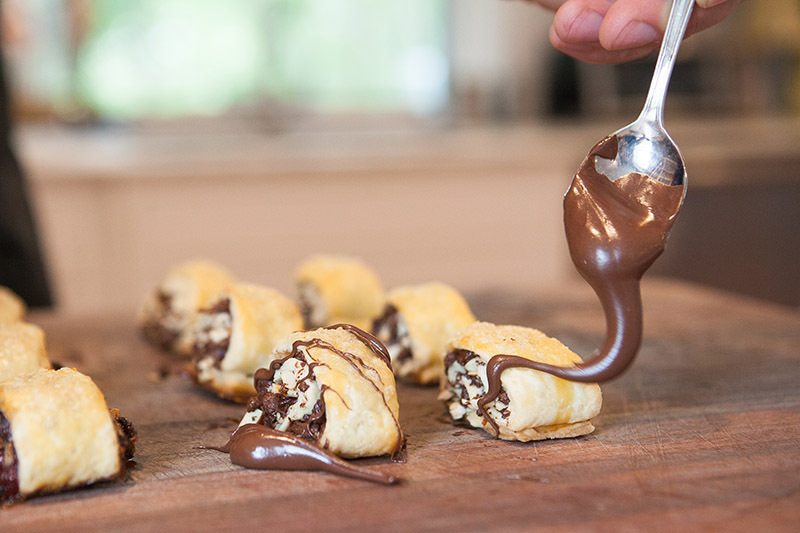 After years of doing odd kitchen jobs, from dishwashing to waiting tables, and with many years of rugelach making under his belt, Lazes only had to do a little testing to find that sweet spot for his creations — flaky on the outside and soft on the inside, with plenty of crunch and flavor. He mostly used recipes he found online to perfect the dough, but went a little more wild to find his fillings. He experimented with caramel brittle, rosemary brown butter, and nutless flavors. (He found that without nuts, you don’t get the crunch that people crave when eating rugelach.) For now, his flavor options are simple but delicious. He offers white chocolate macadamia; chocolate almond; raspberry jelly with currants, walnuts, and raisins; and cinnamon sugar. “It’s hard to beat the [flavors] that everybody talks about and knows about,” Lazes said. 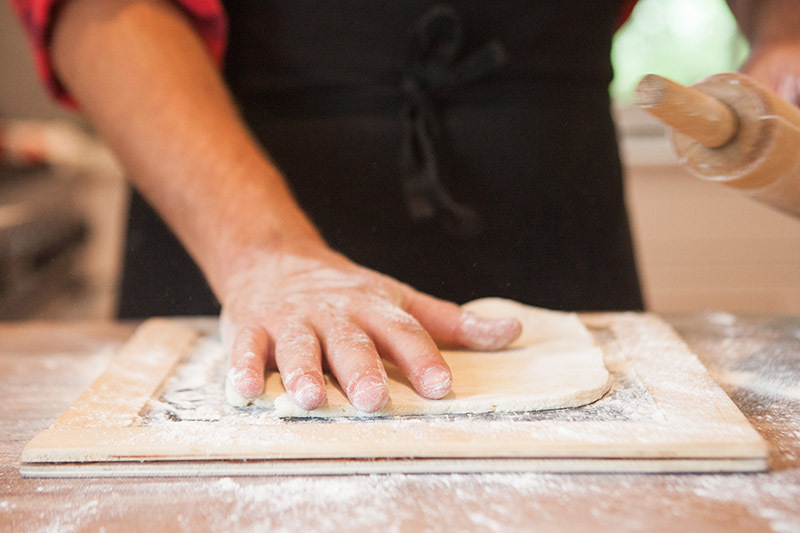 The most ingenious part of Lazes’ process is a handmade wooden frame that he rolls his dough into, to make the perfect-size pieces every time. This was something he built with his dad and customized to fit the size of his dough. Lazes isn’t sure how far this confectionary dream will take him. He currently lives in Boston, but comes back to the Vineyard in the summertime when he works as a counselor at Camp Jabberwocky. As a full-time student itching to see the world, he imagines Not Your Regular Rugelach may continue as a passion project or side hustle. But he’s happy to share his delicious treats with friends and family. You can order rugelach from Avery Lazes now through the end of the year by emailing notyourregulahrugelach@gmail.com. Include the amount and flavor you want (options are white chocolate macadamia; chocolate almond; raspberry jelly with currants, walnuts, and raisins; and cinnamon sugar). Boxes of six pieces of rugelach are $10 each, and can be delivered or mailed.